Our personalized boutique boarding services allow you to go about your day with an ease of mind while your furry companion enjoys our cozy facilities and making new friends. Space is limited, please book in advance! Individual care and attention for your canine companion on 5 country acres. Our rates reflect the fact your dog will be considered a family member while here with us, allowing you both to rest easy while you are away! All guests enjoy daily supervised playtime, one on one attention, attention to manners and fun brain games. Let us do the ground work for you! Just like it sounds, with this package your dog comes to board with us and receives customized training daily. Prior to booking your dog for our Board & Train option, we’ll have a consultation to discuss your needs. A personalized training plan will be designed, and desired goals and behaviours will be identified. 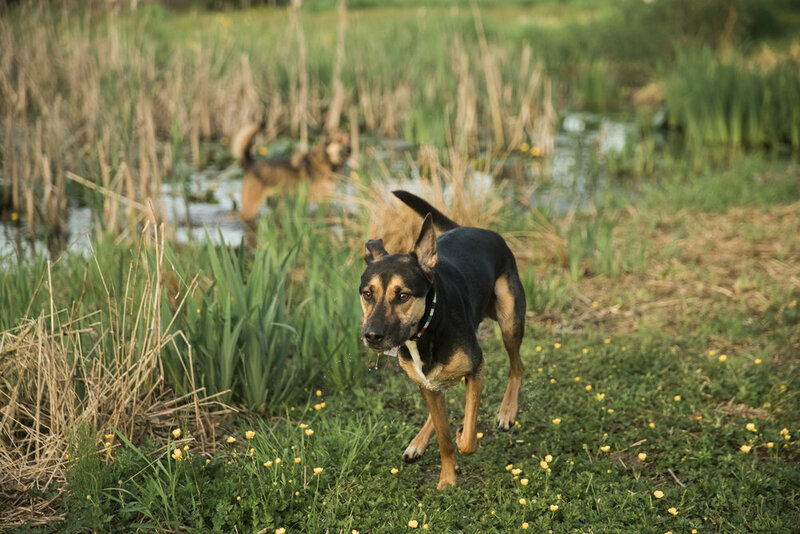 While boarding with us, your dog will receive: several custom training sessions per day, the right balance of exercise and play, and a significantly better understanding of the obedience cues necessary to be successful in your family. At the end of the program, you’ll receive private lessons to ensure everyone is confident handling their newly trained dog. Information handouts on the behaviours your dog has learned will be supplied along with email & follow up support. We consider on each dog’s individual needs and focus on appropriate play. We can accommodate social dogs who enjoy a buddy and guests that prefer one on one human interaction. All boarding activities are customized to suit your dogs needs! Mental stimulation is an important factor in our canine’s wellbeing. We provide that with activities such as brain games, kong stuffing and puzzle’s. Feeding as per your usual schedule (food provided by you). We can accommodate raw feeders and those who have special diets also. Administering meds by qualified veterinary assistant can be offered if needed and as directed. Leash walks and hikes to the local parks and other interesting sights for extended stay guests at no extra cost (30 days and over). This service is also available as an add on for our regular guests. Boarding guests can brush up on their skills while here! Dogs in this program will receive several mini sessions per day to practice their skills and receive extra one-on-one personal engagement. We can work on existing behaviors or start a new one for you. This service is great for all guests! Keep that coat looking fabulous and get a little extra one on one time. Great for all dogs, especially longer coats requiring daily maintenance. The therapeutic benefits of canine massage (K9 Massage) include helping with joints, muscles, and internal organs and keeping your dog happy and calm. It also improves lymphatic and blood circulation systems as well as the nervous system. It enhances flexibility and decreases stress and levels of pain. Icons made by Flaticon. Website design and managed by Aiken Lao.